Okay, admittedly I’m jumping the gun here a little bit, but camping season is just around the corner, and who doesn’t want to sleep under the stars after a day of catching fish? Here are a few random tips I’ve picked up and tested over the years. They should help you stay sane when out on your next wilderness adventure. 1. Insects hide from the wind just like we do. If small stinging and flying insects aren’t your thing, pitch your tent with the door facing the breeze as things like mosquitoes take shelter in the lee of the tent. 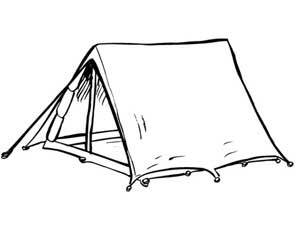 You’ll have a far smaller resident population inside the tent if done correctly. 2. Make a doormat for your tent. A thin 2′ x 2′ piece of nylon works wonders keeping excess dirt and sand outside. 3. Store your sleeping bag hanging in your closet or on the back of a door. Keeping them in stuff/compression sacks robs them of insulating fluffiness. 4. Use the dryer to “reset” the waterproofing on your rain jacket. It works better than any spray on stuff, trust me. Wash gently with no fabric softeners, using dry cycle on low-low heat. You’ll be amazed by the results. 5. Lastly, a useful tidbit: You can use an Aquaseal Wader repair kit to fix a ripped fishing net. Simply take one patch to make a backing material and spread aquaseal on the other side. After 24 hours remove patch and the aquaseal is secure and slippery, making it safe for fish, and you’ve got your net back in business. Video: Ross Reels Announces "Heritage Series"